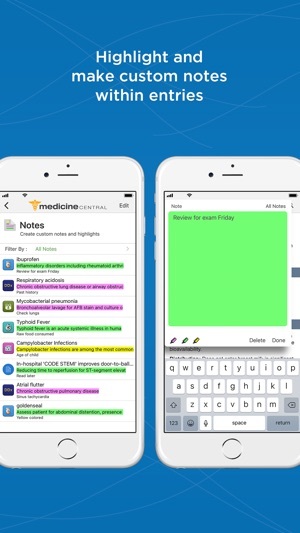 Medicine Central is an integrated mobile and web reference built specifically for physicians, residents, students, and nurse practitioners that includes 5-Minute Clinical Consult, Davis’s Drug Guide, McGraw-Hill’s Diagnosaurus®, Pocket Guide to Diagnostic Tests, and PubMed access. With four trusted references, Medicine Central delivers comprehensive content on the essentials of diagnosis, treatment, and follow-up for more than 900 diseases and disorders in a quick-read format directly to the point of care. 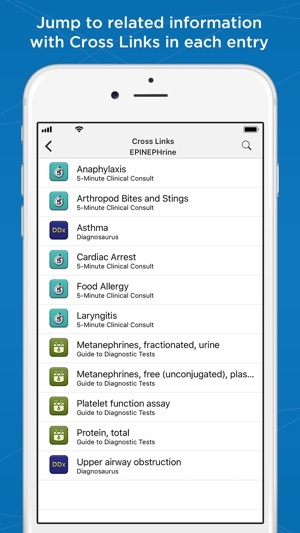 5-Minute Clinical Consult (5MCC) is a best-selling app that features details on over 1,100 medical conditions and 200 pediatric conditions with evidence-based treatment recommendations in a proven, rapid-access format. 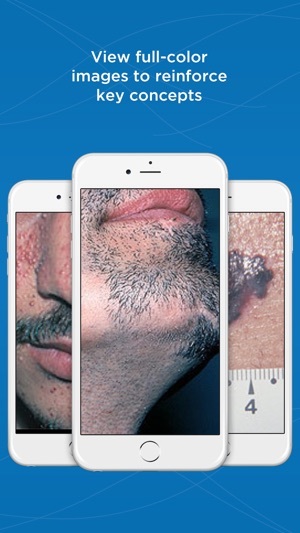 5MCC also includes dermatology images, algorithms for step-by-step patient management, patient teaching points, and more. 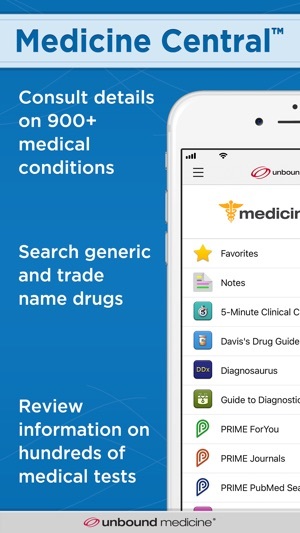 Davis’s Drug Guide is a 5-star app that delivers up-to-date, comprehensive, and practical information on over 5,000 trade name and generic drugs. This best-selling resource contains everything you need to provide premium care to your patients including information on dosing and administration, safety, interactions, and much more. Diagnosaurus allows you to quickly search over 1,000 differential diagnoses by organ system, symptom, disease, or you can view all entries. The valuable "See Related DDx" feature within each listing helps you consider alternative diagnoses and quickly link to those entries. Pocket Guide to Diagnostic Tests provides evidence-based information on the selection and interpretation of more than 450 common laboratory tests. This quick-reference tool includes laboratory tests, diagnostic imaging, therapeutic drug monitoring, microbiology tests, and the use of tests in differential diagnosis. Quickly search the complete PubMed database on your smartphone and tablet. Results contain abstracts, citations, and links to available full text articles which can be easily shared with classmates and colleagues. 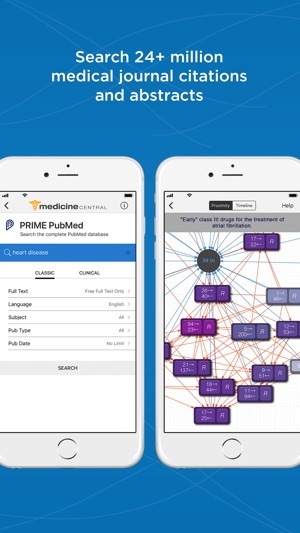 Additionally, Prime PubMed Search contains a powerful, exclusive feature called Grapherence™ which delivers a new way to visually explore the interrelationship and relevance of medical literature. This latest update provides interface upgrades to help enhance the performance of your app. If you have further questions about the new features, please contact Unbound Medicine Support. Thank you for using Medicine Central. I really love this application. I use it mostly for drug information. All I can say is that everything is just great. I also have an app produced by Lexicomp which is also good, but the truth is I prefer using this app for information. The presentation of the information is a lot better, and it is easier to use. You can favorite drugs or articles which is a huge advantage over Lexicomp. I also have the Taber's app by unbound which is great too. I'm starting to become a loyal follower. I had a dying Microsoft phone that was constantly giving me trouble and the customer service department at Unbound Medical never stopped trying to help. They went way beyond what you would expect a company to do and then, when I was finally able to qualify for a new iPhone, they made the transition totally painfree. I have always liked their products but, more important to me, I love the people that stand behind them! this app is very good and useful. keep you updated and it is easy to use. additionally you can use it in the web too. you only need to put the different pathologies in a subgroup like cardiology(ami, heart failure), neurology(epilepsy, gbs) and so on. this way is easier to find a disease . © 2019 Unbound Medicine, Inc.